You have until December 13th to finish. Same rules as last time (http://www.polycount.com/forum/showthread.php?t=106157). This may seem like it's pretty complicated, and if you are starting out it can be overwhelming, so take it piece by piece. This can be broken down into a segments. Think about what will be unique, what will be tiled, what kinda textures you'll need to make, just plan before you go. All that matters is that you learn and give and get advice and are willing to be critiqued, I am thinking that at the end of the month a small prize may be handed out to the winner, nothing significant , maybe a game or something. If you guys like that idea I'm for it. Post what you are working on in this thread so that way it's a more centralized place for advice and critique and we don't have 1000 disjointed parts all over. PS: I am extremely familiar with Cryengine and can answer probably any question you happen to have when using it. PSS: There will be a small prize for completion/best scene, Just Cause 2 for PC on Steam. 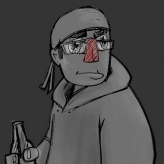 It will be up to you guys to pick the best(if enough people finish this unlike last month). Really cool concept. I wish I had/made more time for these things. Don't have much time tonight so I quickly made some high poly stuffs. 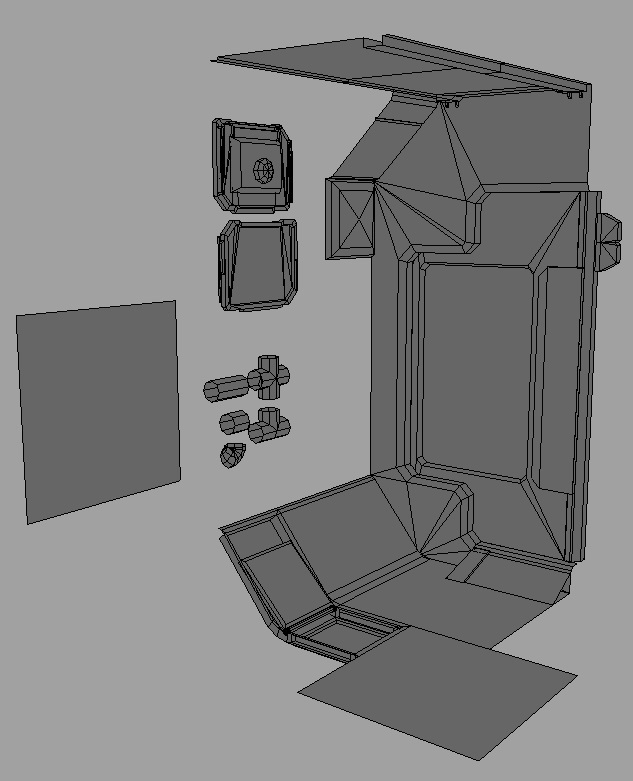 I have the monitor texture sheet laid out and Imma work on that tomorrow after I finish a prop for my other scene. Only reason I'm posting this is to prove I'm participating this month. I don't know how I feel about those side paneling things, or what material they even are... SO I'll prolly re-do it later. Definitely giving this a go. Not sure how I'm going to handle all the wires and pipes yet, guess I'll find out soon enough! As far as texturing use a few tile able textures for the wires themselves. You could also just model. A lot of thing connectors individually and reuse a trim sheet to make them all unique, look decent, and take less time and use less memory. Btw its uses only a 512x512 normal map at the moment. Man! everyone's already starting, now I feel lazy, alright I'm starting. Keep working, but most of all, keep failing, because the only way to success is through failure. If anyone interested, here is a breakdown of the concept what i did to help my (and everybodies) progress. Kinda thrown together to give you an idea, I'm going to make it out of 6 sections. 1 being the turn at the end of the hall, 2 the hall way section with the ridges on either side, 3 the bulkhead, 4 is kind of a backup in case I need a section somewhere, idk what I'll put on it, 5 and six being the padded section and the wire-y section, floors and ceilings will be different models except for maybe on the bulk heads. Also I don't know how open you guys are to changing things about the concept, but I think I might add some key boards. I don't exactly understand the lack of them at the moment. 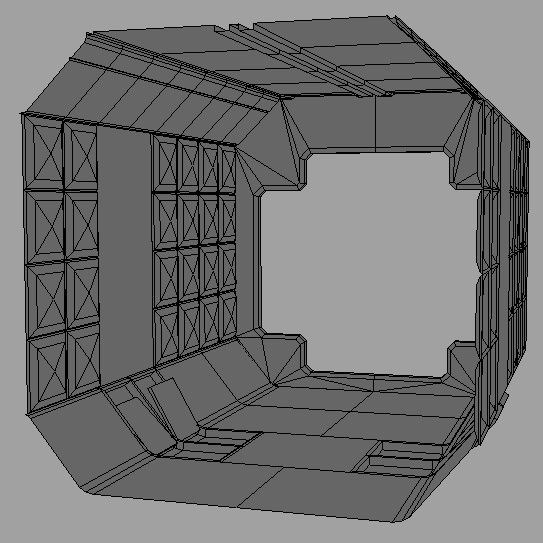 I figured the best way to start is to do 1 part of the enviroment in right proportions,then scale rest based in it. Man, that is an awesome concept! Wow, a lot of participants this month. Keep the momentum up guys. Here is my blockout,, im pretty happy with the proportions,, maybe it needs more width, but im gonna start modelling some pieces. Will be getting in on this, cool concept. Whelp block in for first 3 modules (really only 2 I have to model) is done along with the side and the roof (minus the windows) I also high poly modeled one of the floor segments, I gtg do some stuff for a little while, I'll be back in a while. Also, as for the rest of the modelers in here, Awesomeness is in full effect, amazingly fast progress everyone! 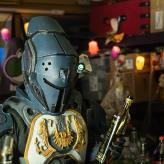 AlexCatMasterSupreme Are you familiar with Maya > Cryengine pipeline? Sorry I use max:/ But I know that Crydev has a wealth of knowledge on it, what do you need to know? On a not un-related note, until now I thought the windows went into other rooms above and below this hall, but now that I think about it I think they go into space and the "other rooms" are actually just the reflections of the room your in... making cube maps will be new for me, this is gonna be exciting. 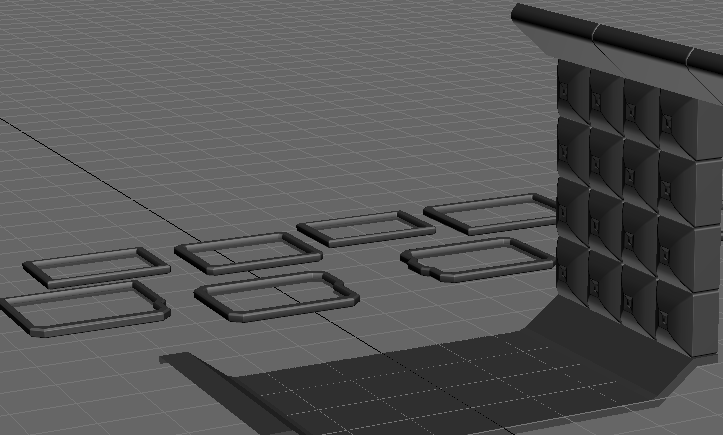 Edit: oh forgot to say, the progress is the middle floor module high poly model, bout to start on the high polys for the walls, I think when I start lagging because of the poly count is when I'll go back and start low poly modeling them. I want to get as much roughed in as fast as possible. (Sticking to the main modules, ignoring things like the monitors and wires and stuff). 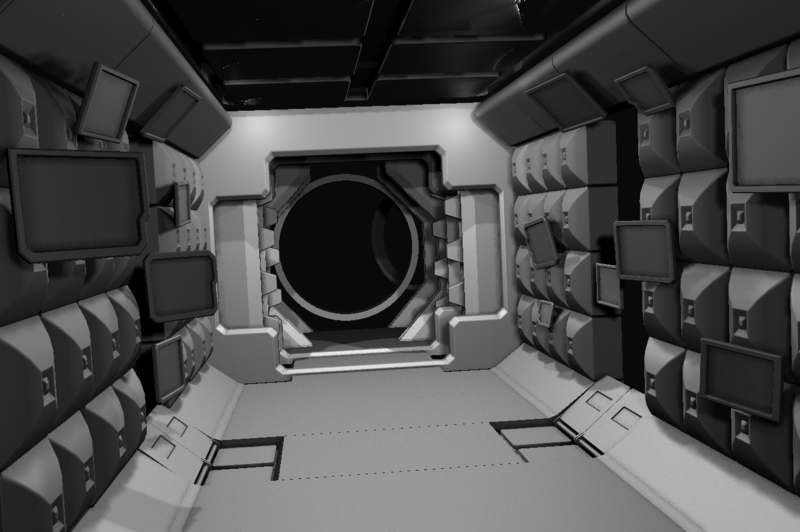 I did a quick test in UDK for scale, then built these modules quickly to mock it up. Thankfully this scene is modular, there's so much detail in the art 0.o. I'll probably have to simplify it down. Nice, i will participate with this one. i really struggle with the planning and the uv's so i hope to learn a lot in those area's. 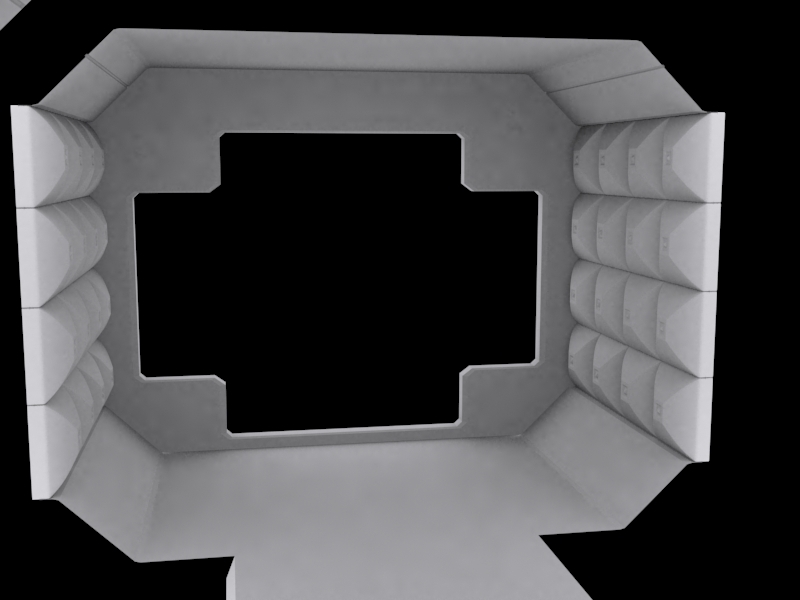 From the looks of it he box modeled it optimized it by hand and beveled the edges, pretty nicely done too. Wow, definitely not the way I would have done it, definitely unique, I'll have to try it that way, do you use maya or 3ds max? There's probably a much better and more efficient way, but that's all I could come up with at a pinch. I use Maya- still need to get around to learning Max! Okeydokey, its late I'm off to bed, this is what I got so far. PS: Idk how much I'm going to get done tomorrow, got allot to do. I will be working on this scene the same way I did for last months challenge. Week 4: Revise and retouch. Will also be throwing my hat in, mostly cause I need portfolio pieces and tutorship rather badly and this is as close as I can get right now :P, I have no girlfriend and aaaaaallll night to work on it, lol. 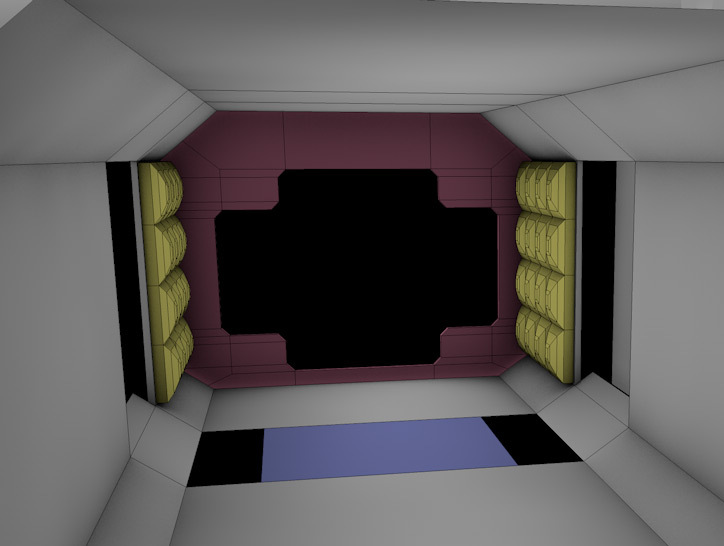 Still have more modular chunks to build up (and I have no idea what I'm doing with that door). Ideas more than welcome. You've already got your modules down? Scruples, you're no noob! Lol Scruples is just here to kick all our bums and make us work harder. I'll soak in any compliments I can, You haven't seen how bad my texturing is . Nice blockouts! I dont make any blockout.Is it a problem, or it doesnt matter?I know the most of artists are make blockouts at the starting of the progress, but i can do without it i think.I just modeling them from piece to piece. Anyway here is my daily update.Finished 2 high and 2 lowpoly model,UV-ed out, and baked the normals and the AO, and started to working in UDK.The reflections (DX11 Image based) are looks a little strange at some areas, i will fix it later, but now continuing with modeling in Max. 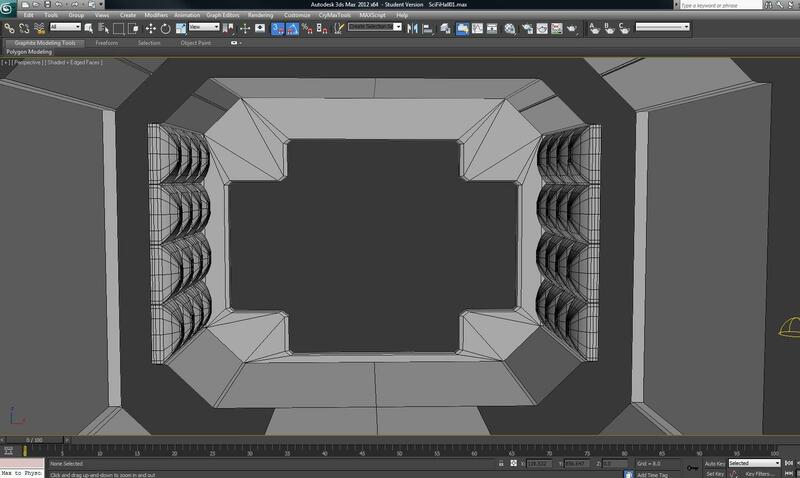 Personally I just make a block out for my own benefit, to see how every thing will fit together, speaking of fitting together could anyone do a quick tutorial on how to do a second uv for lightmass in UDK? (as the second model has some overlapping uv's). Progress, PS: first two are in marmoset and third is both of them in udk, with dynamic lighting. 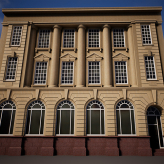 There are some issues with the normal maps but I am confident that I can resolve them in photoshop, I just needed to get rid of some of the high polys in my 3ds max scene, so I went ahead and low poly modeled and normal mapped them. Edit: Oh btw any of y'all who have low poly modeled the floor whats you guys poly counts? For all of the pro's or experienced players here, at what point do you start dropping into engine? I have my layout set to the grid 8,16 so i know it will fit. Do yo export basic blocks then again when its finished or just when its done?